Sounds like a campaign slogan to me. Tax cuts for every citizen! I was so ecstatic about purchasing my first bobbin winder earlier this May, I wanted to share about it with everyone. I didn’t have a blog until June, but it has been been on my mind to to post about since. Between wanting to write and finding time for it, I probably would not have gotten to it if not for recent discussions with fellow Ravelers on this very topic. Judith MacKenzie-McCuin told me that she felt a spinner should have no fewer than thirty bobbins for spinning, but with bobbin prices the way they are (Lendrum bobbins are currently about $17, while Schacht bobbins are about $36), it makes sense to have a bobbin winder and inexpensive storage bobbin spools instead. Oh no, I’m forgetting — my bobbin winder pre-dates my taking her class. (Sorry, I’ve lost many, many brain cells from the sleep deprivation I suffered during my son’s infancy.) So much of what that riveting, soft-spoken woman has said has been repeated by those fortunate to have been in her presence, that my own memories of her words have reverently increased in stature. 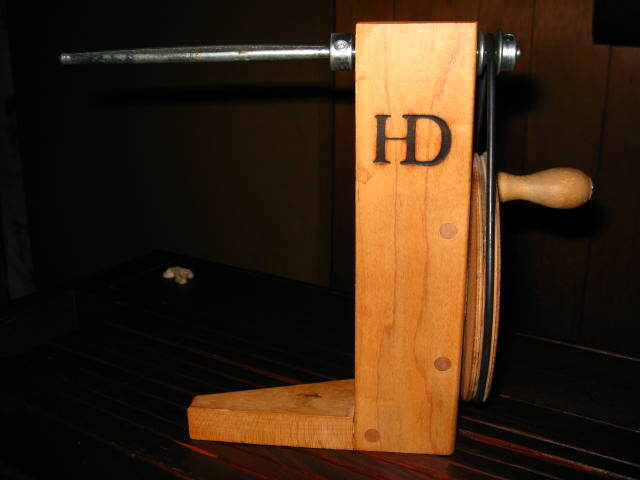 I remember rightly now: It was “The Alden Amos Big Book Of Handspinning” that first prompted me to look for a bobbin winder. Once I started using the bobbin winder, my yarn improved dramatically. This is because, when you wind onto a storage bobbin over a long distance (six feet or more), you even out the twist in the yarn. Singles that have been re-wound onto storage bobbins before plying create a much more consistently plied yarn. 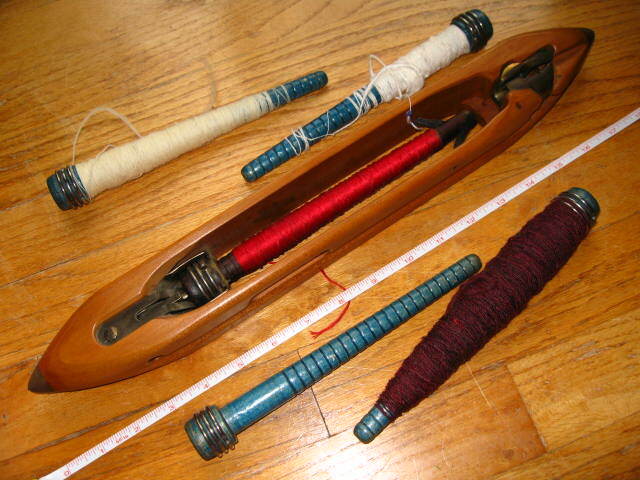 I eliminated many problems of breakage and overtwist by using the bobbin winder. Even re-winding a plied yarn over a distance to a storage bobbin can re-distribute and even out more twist to improve the quality of the ply. You can also re-wind a yarn with the intention to add or subtract twist, depending on the direction of winding and other variables like unwinding the yarn from side or end. In these cases, I am referring to yarn that has not had its twist stabilised by heat and washing, but re-winding affects the twist of stabilised yarns as well. 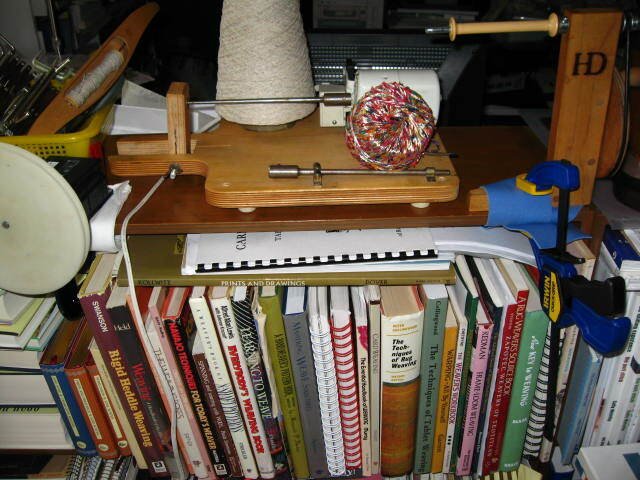 Now, everything I spin is wound off onto a storage bobbin, whether it will be plied or not. The bobbin winder makes that much of a difference. I have not used this winder much, since it is much faster than I’m used to. In one of her books, Peggy Osterkamp recommends rigging an electric winder with a dimmer switch for more speed control. Just another of the many items on my to-do list! I chose to invest in Leclerc storage bobbins because they were the least expensive, most readily available, and came in three sizes. The small bobbins cost under a dollar, and hold perhaps half an ounce of singles, while the longer bobbins (about fifty cents more) may hold up to two ounces. 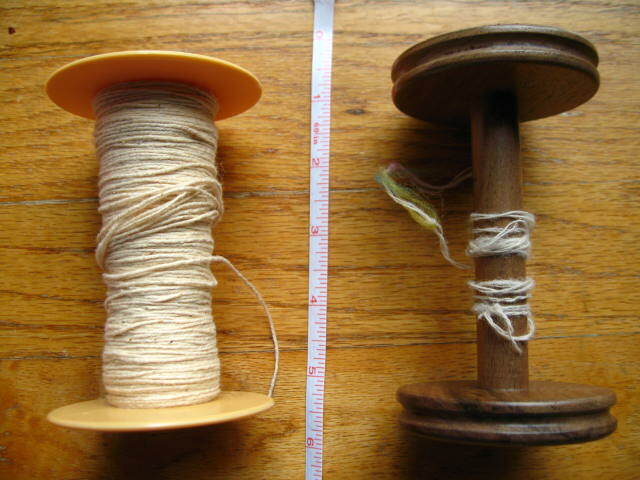 These two bobbin sizes are used by weavers in boat shuttles to carry the weft. 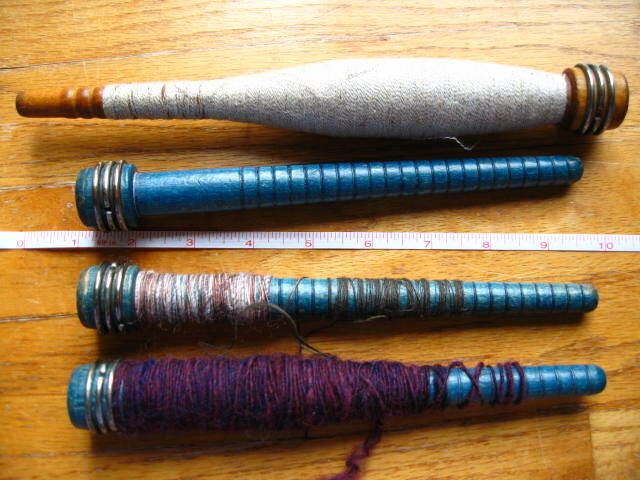 The largest bobbins cost about three dollars each, and can hold at least six ounces of wool. These spools are used by weavers to wind off yarn for sectional warping. I didn’t realise until taking the picture how very close in size the Leclerc spool is to a Lendrum bobbin. Another benefit of the Leclerc polystyrene bobbins is that they are heat-resistant. I have not yet, but there may come a time when I will want to heat-set (steam or boil) yarn singles wound on them. 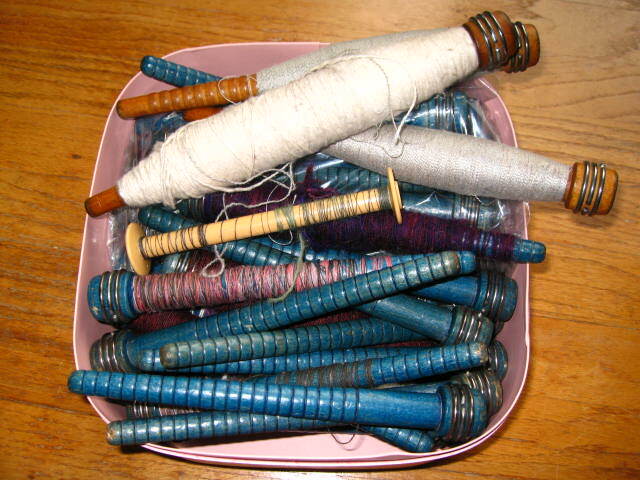 I also purchased a large lot of wooden pirn bobbins from eBay, for what amounted to about twenty-five cents apiece. They are just so pretty to look at! Some of the brown wood pirns even contained some antique wool thread! It’s very instructional to see how a pirn should be properly and tightly wound. After I started weaving, I even found a shuttle that they will fit into, although the shuttle is quite heavy and bulky. I found a safe place to store away the two (!) sets of bongo drums that sat, untouched, atop my bookcases for more than two years. They were purchased at a time when I was convinced my son would be a percussionist, we’d be the world’s first mother-son team… Bringing the drums home put paid to that notion! (I’m not insane, I’m a first-time mother; and no, I haven’t learned how to play them, yet.) Now this space is dedicated as a permanent home for my winding equipment. Before having this setup, I was always looking for a place and a free chair to attach my bobbin winder to. It’s amazing how much time I save by not having to locate it, dig it out, affix it somewhere, then take it down and re-store it, over and over again. I had not realised the vexation that it was until I experienced the lack thereof. And, so delightful, the experience of the uninterrupted rhythm of creativity. Earlier this week, I finally received a walnut bobbin for my wheel from an order I placed eight months ago. I had ordered three extra bobbins; four arrived, but in the end I chose to purchase only one. I’m very happy with my final total of five Lendrum bobbins — the number chosen as what I think is the most I’ll ever need for a workshop (to create a four-ply yarn). 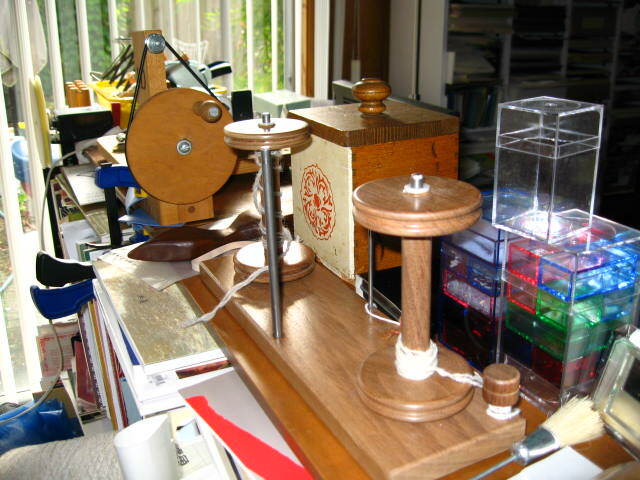 If I were only spinning at home, with my handy bobbin winder, just one bobbin would suffice. And, yes, when I first got my bobbin winder, I did have the fleeting thought: “Perhaps this may be useful in the event I ever decide to weave…” Who knew the mischief that would ensue? 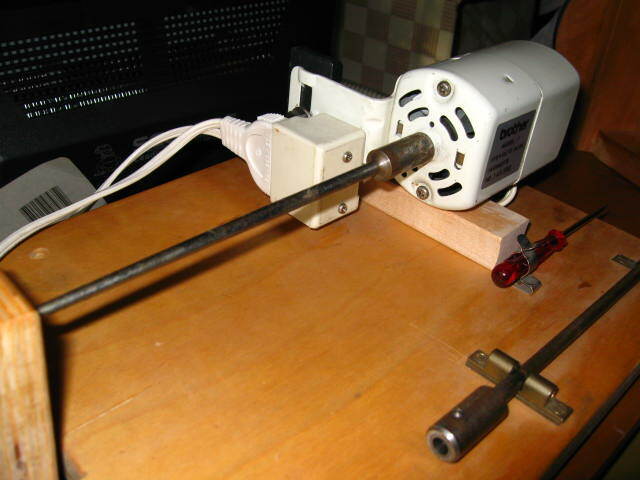 ETA 23 January 2010: see this post for an ultra-portable bobbin winder. I was never interested in knitting. I have done the scarf thing long ago in junior high, but that was it. I’m not sure the scarf was ever finished. Oh, yes, the stash has grown. Even on my non-existent budget, although I cannot afford to buy anything full price. Fifty dollars for a new “educational” toy for my son? No problem! Five dollars for one skein yarn for myself? Unthinkable! I don’t frequent garage sales, but I happened on one where amazing yarns (all wools, mohair, cashmere) were being sold at ten cents on the dollar! Not only that, it was a serious stash, with every yarn being sold in lots of 10 skeins or more of the same dye lot. I spent eighty dollars, but the woman gave me more, and I left with more than a thousand dollars’ worth of yarn. So, I finally finished the raglan sweater, then knit a pair a socks over the 2007 Christmas holiday. (The sweater is too big for my son, but luckily, he likes it, and pretends that it is Obi-Wan Kenobi’s costume. He’ll grow into it.) That’s all I’ve knitted to date. 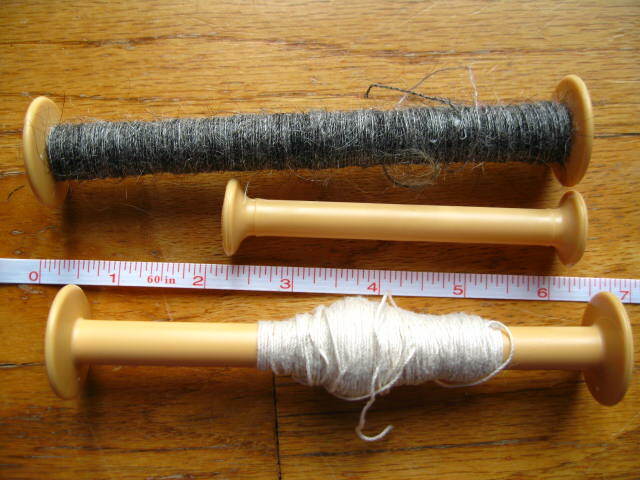 Because as much as I love knitting, it’s nothing compared to what I feel about spinning. Every October, the Seattle Weavers’ Guild holds a sale of items produced by members. I found out about it well over 10 years ago, and having not gone for more than 5 years, decided to last October (2007). I’ve always known that I would one day take up spinning, although I knew nothing of the craft. (This is a recurrent theme in my life!) When I saw one lonely drop spindle left on a table, I knew it was time. That drop spindle came home with me, much to my husband’s future financial woes. This time, I found a local spinning guild, and with much guilt (at first, anyway), began attending the weekly spin-ins. 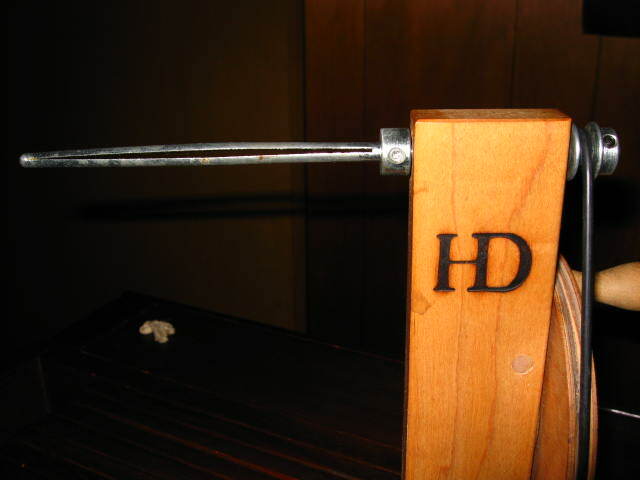 My drop spindle was a bottom-whorl, and I had soon created my own top-whorl spindle out of a CD. 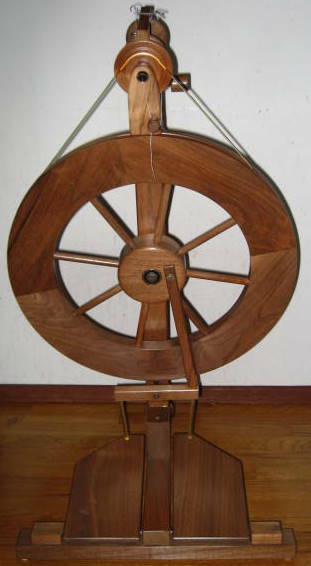 I was so happy with it, I thought I would never need a spinning wheel, so I told the others in my group. I learned to Navajo 3-ply on the drop spindle, doing a Navajo 4-ply (from an article from the Bellwether’s blog) on the drop spindle was beyond me. I knew I had to have a wheel. 2008 February, I purchased my first wheel, an Ashford Traditional. (Raise your hands, all of you who had that as your first wheel!) Prior to that, I had no experience spinning on a wheel. I got it because of good karma. 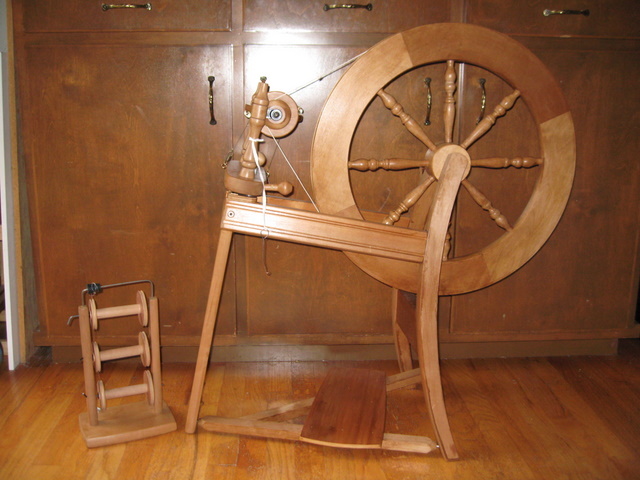 I was being very good: when my husband offered to take Valentines Day off to drive me to the Madrona Fibre Festival being held, I turned him down because I “needed to save money for a spinning wheel”. The following Monday was Presidents’ Day, and I snagged the Traditional deal from CraigsList. It was a brand-new, still in the box wheel (they come unfinished and un-assembled) — that had been stored in the garage for something like twenty years. I brought it home and started the finishing that evening. A few days later, my wheel was assembled, and I was spinning. Recently, I began thinking of a loom. I don’t know why. It wasn’t on my “always thought I would” list. Also, I should point out that I have no room for a loom. I barely have room for my portable spinning wheel. However, I try not to let that sort of thinking stop me. Anyway, I didn’t do much (any) research. I made several half-hearted attempts to acquire a loom. None made it past the inquiry stage, because none of them felt right. A week ago, I began to think I should get a floor loom, with at least 10 treddles and 8 shafts. And then my loom found me. I went to see the loom this past Friday (Friday the 13th, 2008 June! ), and at first all I saw was a pile of dusty, spider-web encrusted old (and in some places splintering) wood. I helped the seller clean off most of the spider-webs, and the loom began emerging. I don’t know what the magic was, but after spending an hour with it piecing it together, (the seller meant to, but never used it herself so she didn’t know how it worked; it had been stored over 30 years in her garage), I got the sense of a very solid and beautifully engineered loom which (by it’s worn appearance) had woven many things and is waiting to weave again. It seemed to me that everything was there, and knowing nothing about looms, my gut instinct was that everything would become intact and functioning, even though it was in pieces. I could feel this was a special loom with character. I had heard about Bergman looms for the first time just earlier this week, since becoming aware of the Nordic Heritage Museum in Ballard and making plans to visit it soon. As I unfolded the loom, I got a sense of a connection to Margaret Bergman — and I believe this may have been a loom she used to teach on. I would be proud to have a share in that long history. I told the seller I didn’t know why I loved it, but I would be back to pick it up the next day. Friday night, I e-mailed a spinning friend, who asked me what type of loom it was (jack, counterbalance, or countermarche). 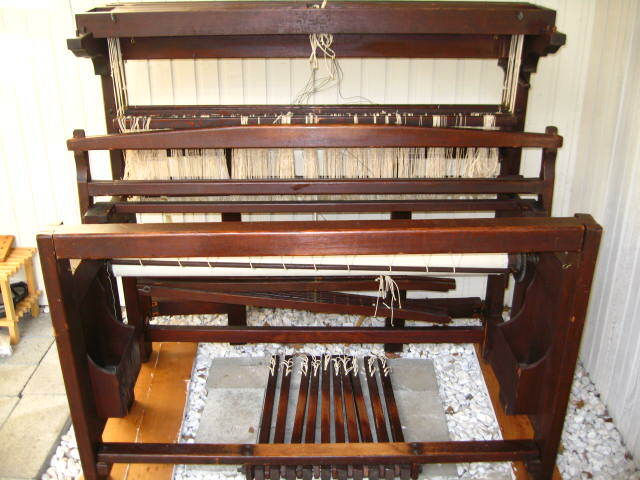 Some research found a blog by someone else who recently purchased a Bergman loom, and it was a countermarche. What a relief! If I had a choice, based on what was learning, I would choose countermarche. Am I lucky or what! So, my loom, the first loom I’ve looked at, is home. I spent a few hours cleaning it off yesterday, and she told me her name is Beauty. I have to clean up my house and make room for it, so she is waiting patiently to come inside and start weaving. So for any uninitiated out there, let me tell what Judith MacKenzie, teacher extraordinaire, told me last week: “After you start knitting, it’s a slippery slope downhill from there.” For the others of you already in the know, I’m very happy to be joining your ranks.